Huanglong is a scenic and historic interest area in the northwest part of Sichuan, China. It is located in the southern part of the Minshan mountain range, 370 kilometres (230 mi) north-northwest of the capital Chengdu. This area is known for its colorful pools formed by calcite deposits, especially in Huanglonggou (Yellow Dragon Gully), as well as diverse forest ecosystems, snow-capped peaks, waterfalls and hot springs. Huanglong is also home to many endangered species including the giant panda and the Sichuan golden snub-nosed monkey. 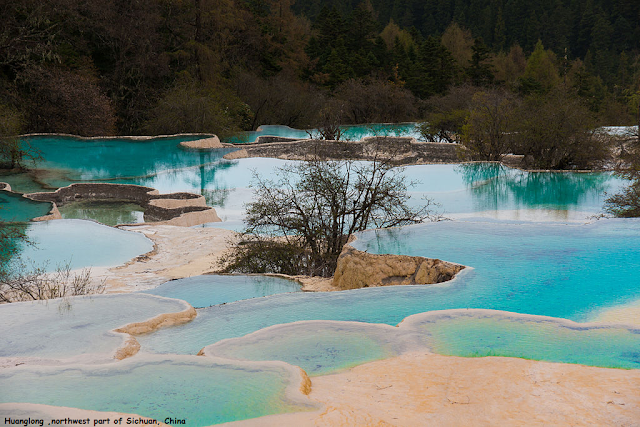 World Heritage Site was declared by UNESCO in 1992 (Huanglong).